Been on vacation yet there is still a weariness that you can’t shake? Wake up feeling as if you wrestled in your sleep? Perhaps it’s not your body that needs rest but your soul. There are all kinds of ways we can find to rest and rejuvenate our bodies. But where do we take our soul to find rest? 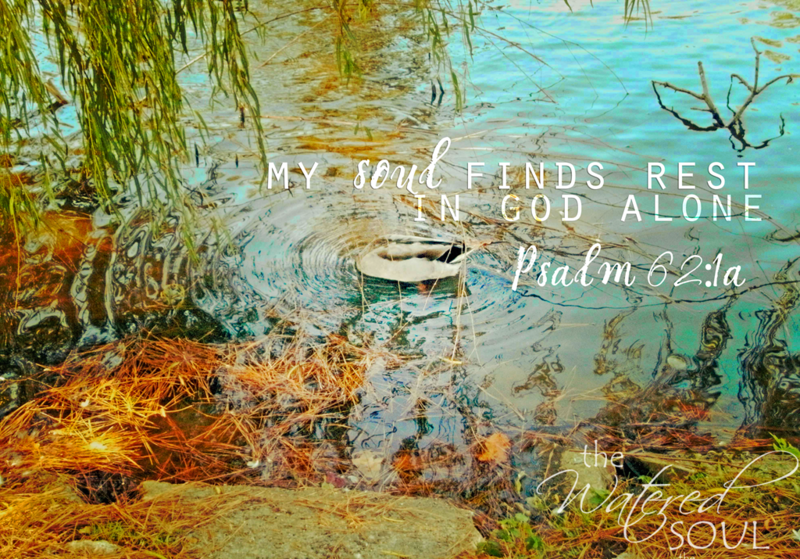 Psalm 62 points us to the place to find soul rest. 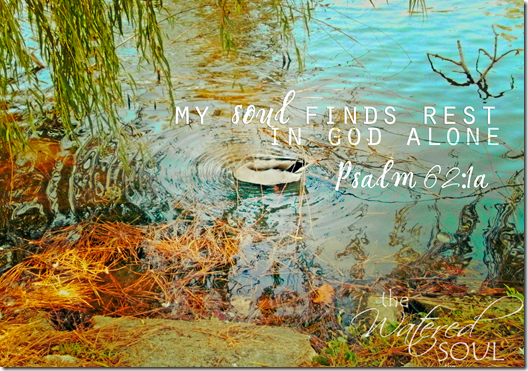 Are you finding rest in God or seeking it elsewhere? That’s the question I meditate upon today. If we’re seeking rest and peace elsewhere, we’ll never find it. That’s why there are so many unhappy and unfulfilled people in the world right now. I try finding rest in God and for the most part I think I’ve been pretty successful. Still there are those people and forces around us that continually want to disrupt our peace and distract us from Godly things. We are in a spiritual struggle that can sometimes be wearying, but when we know that our refuge in God is steadfast then we know we have something to hang onto that won’t drag us down. God is faithful, the world is not. Arlee Bird recently posted..What Shall We Do With Jesus? Knowing where to find that refuge is important. I’m grateful for the tug He provides when I find myself drifting away from the source that can truly provide rest. Jennifer Richardson recently posted..whisper in a crowd….. Always a pleasure to share with friends. Have a wonderful week Rhapsody. Hope it’s one that gives you time for all the above the replenishes you. Blessings. I have to remember that when I am tempted to keep looking other places. I am writing a blog post on just this subject. It’s so important to remember where your soul finds rest. Thanks Ceil, I took it at nearby park last year. I know exactly what you been about finding a place of calm out in nature. I look forward to reading what you learned about soul rest. Like a balm of peace, your thoughts and that Scripture have washed over me today. “Come to Me,” He beckons. For only in Him is there any rest. Oh I love that Sharon, I’ll have to write that REST down in notebook for later. I love the image in this post. It draws me into rest and solitude, things I long for more of in my life. Thanks Barbie, I captured it a local park. Something about water makes me think of rest. I want Soul Rest!!!! Thanks for the reminder that I want this…. Me too Amy. It’s what I need more of these days. Each day giving thanks, understanding ones blessing brings with it a peace that aids in the resting of ones soul. i have an award for you at my place. At your earliest convenience please pick up. thanks. In receiving your award, you are asked to share a little about yourself in for of answers to questions posted.